I trimmed the crusts off of sliced bread and cut some cheddar cheese into long, skinny pieces. 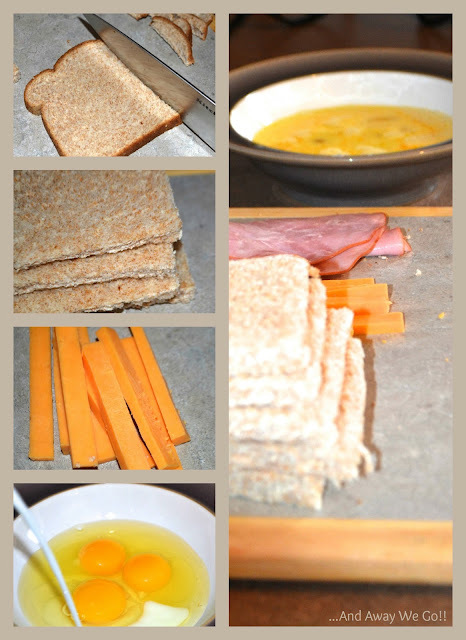 Next, I whisked eggs (1 egg for every 3 rollups) and milk together and set everything out for quick assembly. I rolled each piece of bread flat, with a rolling pin (wine bottle works well too! 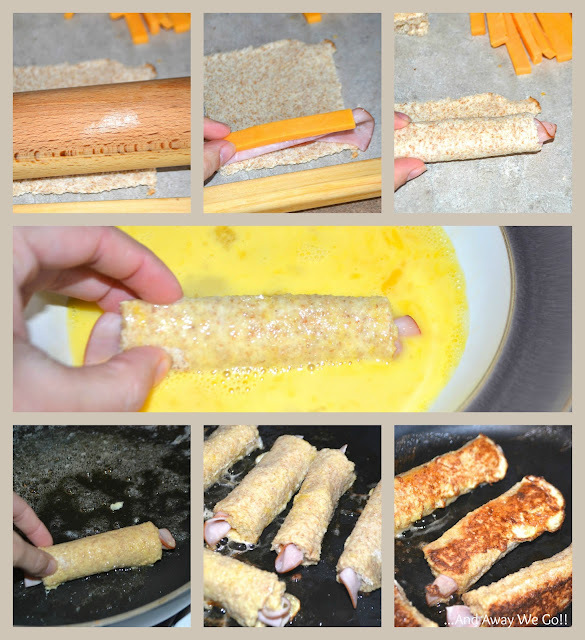 ), placed the cheese and ham at one end, rolled the little package up and dipped it in the egg mixture. I then placed the rollup, seam side down, in a hot skillet with a tablespoon of melted butter. The bread browned quickly, so I gave each roll a turn every thirty seconds or so. Once they were crispy and golden brown all around, I removed them from the skillet and breakfast was served! They were very tasty, and super easy for my little guy to handle (not as messy as a sandwich)! 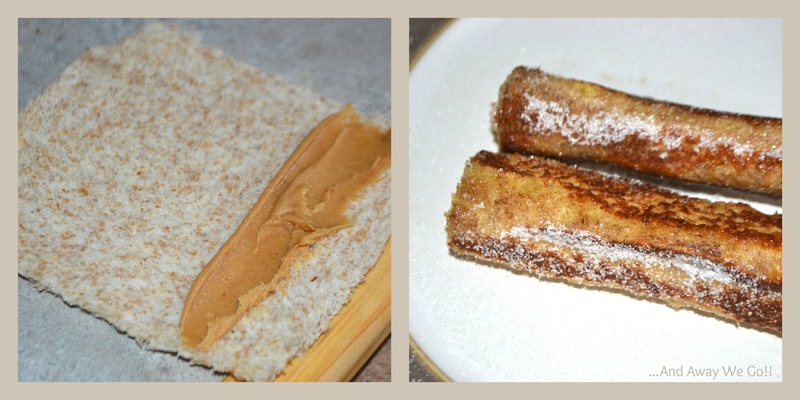 ...and just because we are a family of peanut butter addicts, we gave this a try! I sprinkled the outside with sugar and we dipped them in syrup!! Gotta love Breakfast Dessert!! 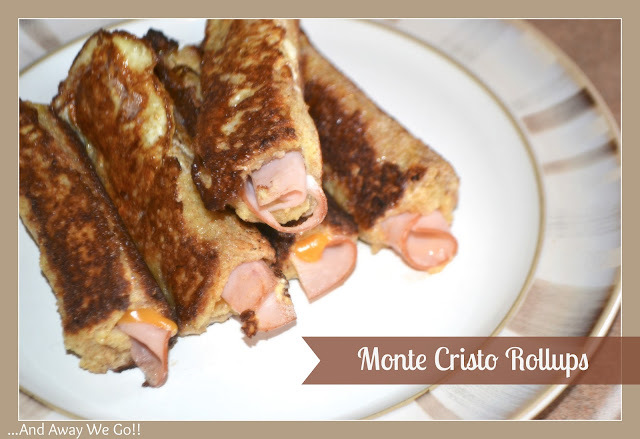 I vaguely remember that conversation years ago about the Monte Cristo, your new twist looks yummy! I can't wait until you make them for me. I LOVE monte cristos!!!! And these look fun and easy! =) Happy Wednesday!